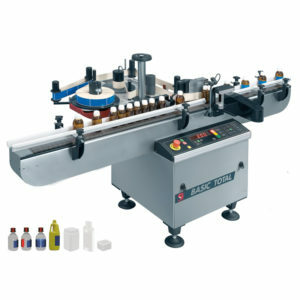 Bottle labelling machines: Basic Total 200 Wrap around labelling machine. Bottle labelling machines, the Basic 200 is an easy to operate labeling machine with label counter and pre-set batch controls. Keyboard and digital display suitable for a wide range of cylindrical labelling applications. It has a stepper motor for fast and accurate labelling and has opaque label detection as standard. Most noteworthy a pneumatically operated three roller label applicator for optimum label placement. Yet with easily adjustable pre-dispensing and label positioning with graduated scale. Easy to operate integrated controlled system with label counter and pre-set batch controls. keyboard and digital display. Suitable for a wide range of cylindrical labelling applications. Stepper motor: So fast and accurate labelling. Opaque label detection as standard. Pneumatically operated three roller label applicator for optimum label placement.